Recently, several new imaging technologies, such as three-dimensional (3D)/high-definition (HD) stereovision and high-resolution two-dimensional (2D)/4K monitors, have been introduced in laparoscopic surgery. However, it is still unclear whether these technologies actually improve surgical performance. Participants were 11 expert laparoscopic surgeons. We designed three laparoscopic suturing tasks (task 1: simple suturing, task 2: knotting thread in a small box, and task 3: suturing in a narrow space) in training boxes. Performances were recorded by an optical position tracker. All participants first performed each task five times consecutively using a conventional 2D/HD monitor. Then they were randomly divided into two groups: six participants performed the tasks using 3D/HD before using 2D/4K; the other five participants performed the tasks using a 2D/4K monitor before the 3D/HD monitor. After the trials, we evaluated the performance scores (operative time, path length of forceps, and technical errors) and compared performance scores across all monitors. Surgical performances of participants were ranked in decreasing order: 3D/HD, 2D/4K, and 2D/HD using the total scores for each task. In task 1 (simple suturing), some surgical performances using 3D/HD were significantly better than those using 2D/4K (P = 0.017, P = 0.033, P = 0.492 for operative time, path length, and technical errors, respectively). On the other hand, with operation in narrow spaces such as in tasks 2 and 3, performances using 2D/4K were not inferior to 3D/HD performances. The high-resolution images from the 2D/4K monitor may enhance depth perception in narrow spaces and may complement stereoscopic vision almost as well as using 3D/HD. Compared to a 2D/HD monitor, a 3D/HD monitor improved the laparoscopic surgical technique of expert surgeons more than a 2D/4K monitor. However, the advantage of 2D/4K high-resolution images may be comparable to a 3D/HD monitor especially in narrow spaces. This work is supported by JSPS KAKENHI Grant Number JP16K12911. 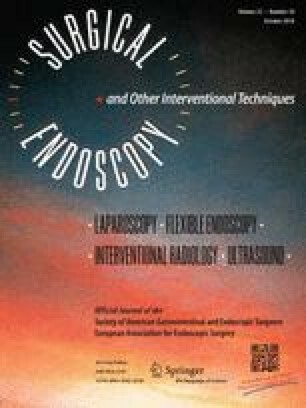 Participating investigators Endoscopic surgical skill qualification system: qualified surgeons; Goto H, Oyama M, Yasuda T (Hyogo Cancer Center, Akashi, Hyogo, Japan), and Kanemitsu K (Yodogawa Christian Hospital, Osaka, Osaka, Japan) significantly contributed as participants in this study. Drs. Hitoshi Harada, Shingo Kanaji, Hiroshi Hasegawa, Masashi Yamamoto, Yoshiko Matsuda, Kimihiro Yamashita, Takeru Matsuda, Taro Oshikiri, Yasuo Sumi, Tetsu Nakamura, Satoshi Suzuki, and Yoshihiro Kakeji have no conflicts of interest or financial ties to disclose.